Ti Ylang Villa in Flamands, St. Barts is a great getaway for couples who want to experience privacy, relaxation, and complete serenity. The home is surrounded by tropical greenery and includes a large patio, deck, and heated pool. There is an outdoor bar area as well as plenty of outdoor furniture for relaxing in the sun or shade, depending on which area you choose. Inside, the home has a queen bedroom, en-suite bath, living area, dining, and full kitchen for preparing meals and snacks. Restaurants and groceries are just a 5-minute drive away, and there is daily maid service. This nice one-bedroom villa offers a large living area with a fully equipped kitchen (even an espresso machine) and a pool. 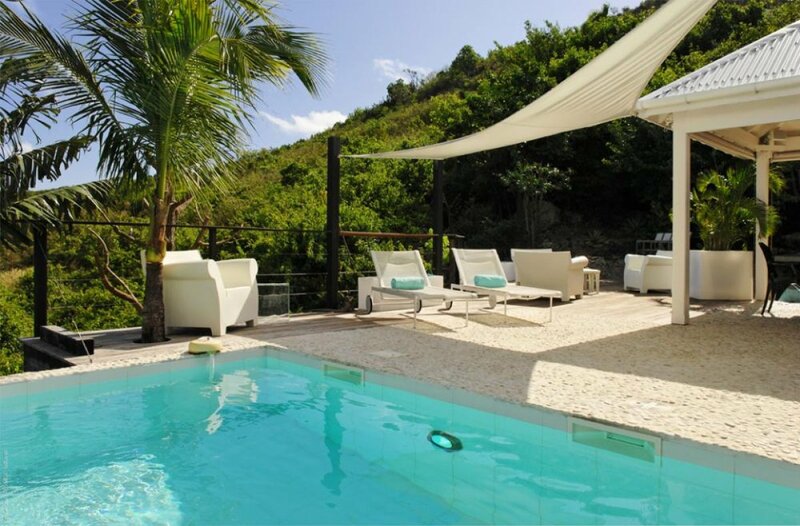 The villa has Wi-Fi and a heated pool (in the winter months). Very private and romantic. The air-conditioned bedroom offers a garden view, and is furnished with a queen bed, ceiling fan, mosquito net, safe, TV, French satellite, DVD, and a bathroom with shower. The location in Flamands is perfect. Just 5 minutes to restaurants and a grocery and another 5 minutes to the airport and Gustavia Harbour. There is a cat that lives at this villa. This villa accepts 10 nights during Christmas/New Years.